So, I need to apologize to everyone–I’ve been a bit of a mess and behind on, just about everything. That’s not really an excuse, but that’s the way it is. Hobby or not, I’ve dropped the ball updating WaM and it makes me feel worse knowing it’s during the Pair-a-Thon. As for today’s Pin-Up…this is me compromising. The person it’s for probably knows what I’m compromising since I still haven’t coughed up the goods in a year. XD Wheeeeeeeeee. At least you got last Sunday’s colored finally. Oh no! Bliss exploded again, and this time so brightly that no pink remains! I hereby nominate this as the scariest pin-up yet. Yes it is. She’ll get it drawn don’t worry. My God… This Pin-Up is the most gorgeous thing I’ve ever seen. I would never have thought of having Grace and Eclat fighting from Wiglaf’s point of view in the middle of a snowstorm. Absolute genius! XD I love it! Very much Wiglaf vs. Squirrel. And everyone knows, even the bluebird, that Wiglaf won’t actually hurt the rascally rodent. Wow, Wiglaf’s got a serious eye twitch going on there. XD The squirrel and the bird are so cute though! If I ever see that expression on Wiglaf during the canon comic, mind, I’m going to go hide under my bed. The squirrel is lucky that Wiglaf has too much class to harm a small animal, even when he’s annoyed by it. XD Together with the bluebird, this makes a real cute portrait. 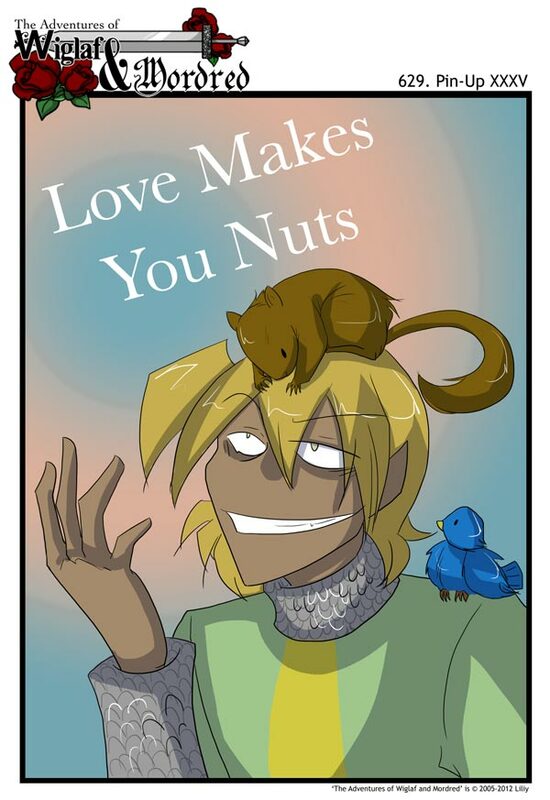 I’m glad this is up now, and I’ve got to say that Wiglif’s expression is ….Squirrel! … Just perfect. And anyone who can tell me what that ‘Squirrel’ is from gets a prize, or maybe not. The squirrel is from the sketch comic Wiglaf VS Squirrel which can be found by clicking “Vote TWC” at the top of the page.